When I had to make a special dinner last night what came to mind? Lasagna...hmmm, fresh pasta lasagna...hmmm, a tri-color fresh pasta lasagna, that’s it! I have a basil plant and it has a name: Rupert Basilbear. (You can blame Franny for the last name, and yes, I feel like a dork.) Anyway, I harvested some fresh basil and added it to a very large portion of some market spinach, which I bought a 1/2 kilo of on Saturday and am scrambling to eat. After blanching the spinach in salted water I added it to the basil, garlic, salt, and some olive oil and blended it until I had a spinach pesto. Green? Done. For the color white I chose to count the fresh pasta which was a 1/3 all-purpose flour (finomliszt for those of you who are keeping track of the Hungarian) and 2/3 durum mixture. Included with this layer is the cheese mixture, for which I caramelized one large onion with crushed red pepper and after chilling it to room temperature I added 250g of ricotta, and 200 grams of finely chopped mozzarella and mixed it thoroughly. White layer? Check! Last up: red team. Now I almost went with tomatoes for this one, but there aren’t any in season of course. I could have chosen some canned sauce, but resolved to wait until summer (when I will down a kilo of fresh tomatoes a day) to draft tomatoes onto this team. I decided to try something new, but stay within cold weather traditions. I started with a base of cream and butter for the sauce and added fresh paprika until I had a bright red cream sauce ready to complete the tri-color. As expected it tasted like roasted peppers....delicious! To assemble: I started with paprika cream sauce, laid down pasta sheets, put some caramelized onion cheese mixture on top of that, and finished the pattern with spinach pesto. I built up a five layer lasagna and put it into a 175 C oven for about 40 minutes and cooked it to perfection. All of the flavors worked together really well. The salty caramelized cheese mixture was balanced by the roasted pepper sauce, which was put in check by the fresh green taste of the spinach pesto, and to hold it all together the pasta sheets were chewy and delicious. I was really happy about this dish for a couple of reasons: 1) the prep work (pesto making, onion cooking, cheese mixing, sauce making, and pasta kneading) took an hour and a half, which was good quality me time, 2) I had Franny to help roll out the pasta sheets by hand (the pasta machine is in Kalocsa) and help with the assembly, and 3) olive oil being the only exception, all the ingredients came from the market or are local. 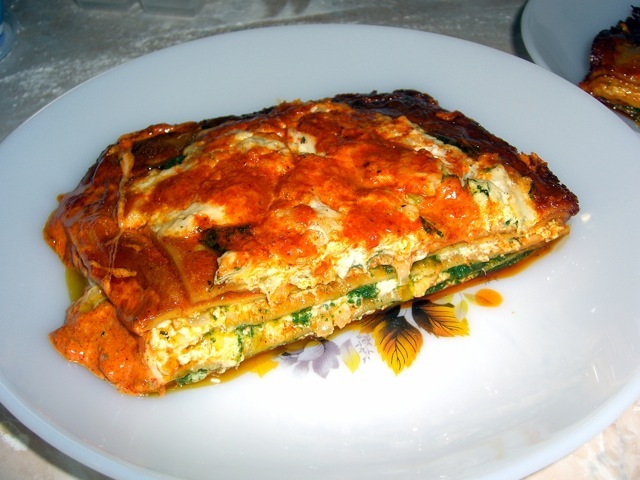 The eggs, garlic, spinach, and even the paprika came from farmer’s markets while the cream, butter, flour, salt, and basil all came from Hungary. Buon Appetito!